﻿Bruce Goodman's "The cruel case of missing pegs"
Margaret used only pink plastic clothes-pegs (clothespins) on her line. 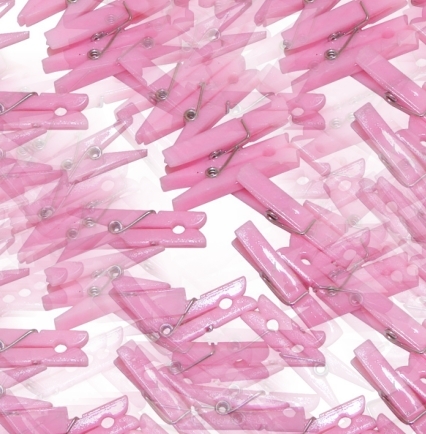 Pink is easier to see if the pegs fall off the line and lie in the grass, said Margaret. Besides, pink is pretty. Margaret noticed that over time, there seemed to be fewer and fewer pegs. Strange, thought Margaret, they’re not in the grass on the lawn. Eventually, there were only two pegs left. Where had the pegs gone? Was it a bird? Some of those magpie-type birds collect pretty things to decorate their nests. It didn’t seem to be. Besides, there were no magpies in the area. Was it the wind? They would be lying about. Was it a thief? All the pegs would have gone at once, and not slowly, in dribs and drabs. So where did the pegs disappear to? Aha! thought Margaret one day in a flash of inspiration. Mystery solved!